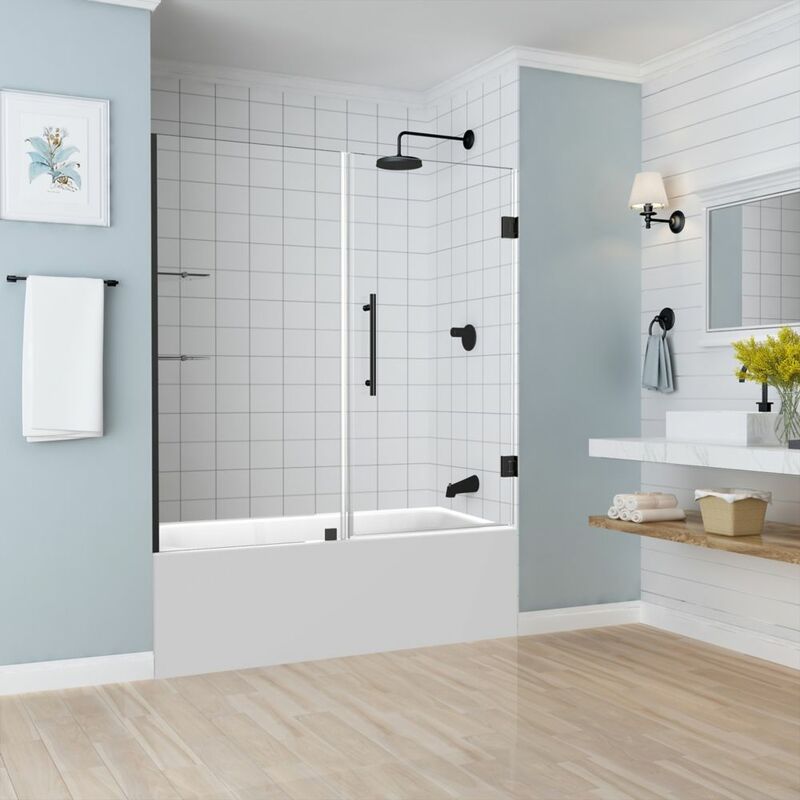 Belmore GS 59.25 - 60.25 x 60 inch Frameless Hinged Tub Door with Glass Shelves in Oil Rubbed Bronze The Belmore GS Frameless 60 inch x 60 inch Hinged Tub Door with Glass Shelving provides your bathtub alcove with a wall to wall open air presence utilizing the highest quality materials. Its two-tier integrated glass shelving feature provides stability as well as additional storage. The Belmore GS features premium clear 3/8 inch tempered safety glass; tested and certified to ANSI Z97.1 Standard with StarCast by Enduroshield easy clean coating, ensuring your Aston door stays beautiful for years to come. Its inline wall channel presents a solution for uneven bathroom walls providing up to 1 inch of out-of-plumb adjustment and is designed for left of right hand installation. Available in multiple hardware finish options, this ready to install frameless tub door will bring simplistic sophistication to any project. Images are for representation only. Once installed, glass may differ slightly than shown in image due to light absorption and reflection. Belmore GS 59.25 - 60.25 x 60 inch Frameless Hinged Tub Door with Glass Shelves in Oil Rubbed Bronze is rated 4.9 out of 5 by 39.